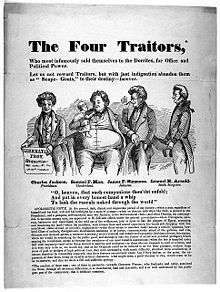 The Dorr Rebellion (1841–1842) was an attempt by middle-class residents to force broader democracy in the U.S. state of Rhode Island, where a small rural elite was in control of government. It was led by Thomas Wilson Dorr, who mobilized the disenfranchised to demand changes to the state's electoral rules. The state was still using its 1663 colonial charter as a constitution; it required that voters own land. A later legislative rule required that a man be white and own $134 in property in order to vote. In addition to disenfranchisement of individuals, the state was dominated by rural interests. It had maintained representation in the legislature by towns. Under this geographic system, the larger populations in cities were dramatically under-represented. The effect in the 1830s was that the rapidly growing industrial cities were far outnumbered in the legislature by representatives of rural towns, to the annoyance of major businessmen and industrialists of the cities. The state legislature lagged in investing in infrastructure and other needs for urbanizing areas, and generally did not respond to urban needs. Furthermore, because of the property requirement, few immigrants or factory workers could vote, despite their growing numbers in the state. In 1840 other states that had been receiving immigrants had a huge surge in turnout, but Rhode Island voting remained suppressed. At first, the middle classes took the lead in seeking change, including Dorr himself. He worked with the Rhode Island Suffrage Association. But the Charter government, controlled by rural elites, fought back hard. For six weeks in 1842, there were two rival governments. The Dorrites, led by self-proclaimed Governor Dorr, pulled back from violence (after their cannon misfired). Only one person died, a bystander killed by accident. The Charter government compromised. It wrote a new constitution in 1843 that dropped the property requirement for men born in the United States but kept it for foreign-born citizens, and it apportioned more seats in the legislature to the cities. That satisfied the native-born protesters. The state government had the upper hand; the national government refused to intervene, and Democrats in other states gave Dorr only verbal encouragement. His cause was hopeless—he and five lieutenants were sentenced to life in prison. They were pardoned by the state governor in 1845 after the political agitation had ended. But the state did not drop the property qualifications for immigrant voters until 1888, at a time of increasing immigration. In the 1844 presidential election following the Dorr Rebellion and changes to voter requirements, some 12,296 votes were cast in Rhode Island, a significant increase from the 8,621 cast in 1840. Under Rhode Island's colonial charter, originally received in 1663, only male landowners could vote. At the time, most of the citizens of the colonies were farmers and held land, and this qualification was considered fairly democratic. By the 1840s, the state required landed property worth at least $134 in order to vote. As the Industrial Revolution reached North America and many people left the farms for the cities, large numbers of people could no longer meet the minimum property requirement to vote. By 1829, 60% of the state's free white men were ineligible to vote (women and most non-white men were prohibited from voting). Many of the disenfranchised were recent Irish Catholic immigrants or other Roman Catholics who lived and worked in the cities at salaried jobs. Some  argued that an electorate made up of only 40% of the state's white men, and based on a colonial charter signed by the British monarch, was un-republican and violated the United States Constitution's Guarantee Clause, Art. IV: Sec. 4 ("The United States shall guarantee to every State in this Union a Republican Form of Government [...]"). Before the 1840s, activists made several attempts to replace the colonial charter with a new state constitution that provided broader voting rights, but all failed. The state lacked a procedure to amend the Charter. The Rhode Island General Assembly, dominated by rural landowners, had consistently failed to liberalize the constitution by extending the franchise, enacting a bill of rights, or reapportioning the legislature based on demographic changes as the cities acquired much larger populations. By 1841, most states of the United States had removed property requirements and other restrictions on voting (see Jacksonian democracy). Rhode Island was nearly the only state falling significantly short of universal white manhood suffrage. In 1841, suffrage supporters led by Dorr gave up on attempts to change the system from within. In October, they held an extralegal People's Convention and drafted a new constitution which granted the vote to all white men with one year's residence. Dorr had originally supported granting voting rights to blacks, but he changed his position in 1840 because of pressure from white immigrants, who wanted to gain the vote first. At the same time, the state's General Assembly formed a rival convention and drafted the Freemen's Constitution, with some concessions to democratic demands. Late in that year, the two constitutions were voted on, and the Freemen's Constitution was defeated in the legislature, largely by Dorr supporters, while the People's Convention version was overwhelmingly supported in a referendum in December. Much of the support for the People's Convention constitution was from the newly eligible voters, but Dorr claimed that most of those eligible under the old constitution had also supported it, making it legal. Most of the state militiamen were Irishmen newly enfranchised by the Dorr referendum; they supported him. The Irish who played a growing role in Democratic politics in other states, such as Tammany Hall in New York City, gave Dorr their verbal support, but sent no money or men to help. The "Dorrites" led an unsuccessful attack against the arsenal in Providence, Rhode Island on May 19, 1842. Defenders of the arsenal on the "Charterite" side (those who supported the original charter) included Dorr's father Sullivan Dorr and his uncle Crawford Allen. At the time, these men owned the Bernon Mill Village in Woonsocket, Rhode Island. In addition, among the defenders of Providence were many black men who had supported Dorr before he dropped them from his call for suffrage. Dorr's cannon failed to fire, no one was hurt, and his army retreated in disarray. After his defeat, Dorr fled to New York and returned in late June 1842 with armed supporters and assembled his forces on Acote's Hill in Chepachet, where they hoped to reconvene the People's Convention. Governor King called out the state militia which marched on Chepachet to engage the Dorrite forces. Charterite forces were sent to Woonsocket to defend the village and to cut off the Dorrite forces' retreat. The Charterites fortified a house in preparation for an attack, but it never came. Dorr disbanded his forces, realizing that he would be defeated in battle by the approaching militia, and fled the state. Governor King issued a warrant for Dorr's arrest with a reward of $5,000. The Charterites were finally convinced of the strength of the suffrage cause and called another convention. In September 1842, a session of the Rhode Island General Assembly met at Newport, Rhode Island and framed a new state constitution which was ratified by the old, limited electorate, was proclaimed by Governor King on January 23, 1843, and took effect in May. The new constitution greatly liberalized voting requirements by extending suffrage to any native born adult male, regardless of race, who could pay a poll tax of $1, which would go to support public schools in the state. The constitution retained the property requirement for non-native born citizens and prohibited members of the Narragansett Indian Tribe from voting. In the next Presidential election held after the Dorr Rebellion in 1844, 12,296 votes were cast, a significant increase from the 8,621 cast in 1840. In Luther v. Borden (1849), the Supreme Court of the United States held that the constitutional right to change governments was unquestioned, but that the Supreme Court did not have the authority to interfere because the Constitutional guarantee of a "republican form of government" was a political question best left to the other branches of the federal government. This ruling ducked the actual issue, but its practical effect was to leave the Dorrites in the cold and uphold their opponents as the true government of Rhode Island. Dorr returned in 1843, was found guilty of treason against the state, and was sentenced in 1844 to solitary confinement and hard labor for life. The harshness of the sentence was widely condemned, and Dorr was released in 1845, his health now broken. His civil rights were restored in 1851. In 1854, the court judgment against him was set aside. He died later that year. Historians have long debated the meaning and nature of the rebellion. Mowry (1901) portrayed the Dorrites as irresponsible idealists who ignored the state's need for stability and order. Gettleman (1973) hailed it as an early working-class attempt to overthrow an elitist government. Dennison (1976) saw it as a legitimate expression of Republicanism in the United States, but concluded that politics changed little for Rhode Islanders after 1842 because the same elite groups ruled the state. 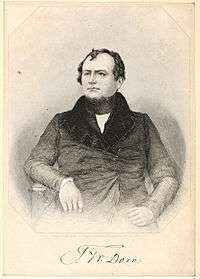 However, in 1854, the Rhode Island Supreme Court wrote: "The union of all the powers of government in the same hands is but the definition of despotism". Thus, the same Court that convicted Dorr of treason against the charter in 1844 ruled ten years later that the charter had improperly authorized a despotic, non-republican, un-American form of government (Dennison, p. 196). Coleman (1963) explored the complex coalition that supported Dorr, with the changing economic structure of the state in mind, noting that the middle classes, the poor farmers, and the industrialists mostly peeled off after the 1843 Constitution gave in to their demands. The factory workers remained but were too few and too poorly organized to do much. He finds Seth Luther to be one of the few stalwarts from the working class. ↑ David Leip. "1840 Presidential General Election Results". Retrieved 4 March 2016. 1 2 "The Constitution of Rhode Island 1843". Retrieved 4 March 2016. 1 2 Gettleman, Marvin E. (1973). The Dorr Rebellion: A Study in American Radicalism, 1833–1849. ISBN 978-0-88275-894-7. 1 2 David Leip. "1840 Presidential General Election Results - Rhode Island". Retrieved 4 March 2016. 1 2 David Leip. "1844 Presidential General Election Results - Rhode Island". Retrieved 4 March 2016. ↑ "Warwick". Retrieved 4 March 2016. ↑ 1843 Constitution of Rhode Island. Article II. ↑ George M. Dennison, "The Dorr War and Political Questions," Supreme Court Historical Society Yearbook (1979), pp 45–62. Chaput, Erik J. The People's Martyr: Thomas Wilson Dorr and His 1842 Rhode Island Rebellion (2013). Chaput, Erik J. "'The Rhode Island Question': The Career of a Debate," Rhode Island History (2010) 68#2 pp 46–76. Chaput, Erik J. "The 'Rhode Island Question' on Trial: The 1844 Treason Trial of Thomas Dorr," American Nineteenth Century History (2010) 11#2 pp 205–232. Conley, Patrick T. "Popular Sovereignty or Public Anarchy? American Debates the Dorr Rebellion," Rhode Island History (2002) 60#3 pp 71–91. Gettleman, Marvin E. (1973). 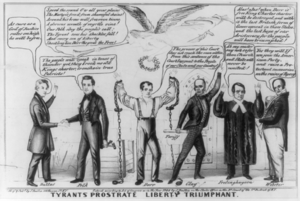 The Dorr Rebellion: A Study in American Radicalism, 1833–1849. ISBN 978-0-88275-894-7.